I’m just about over Drew’s braces. 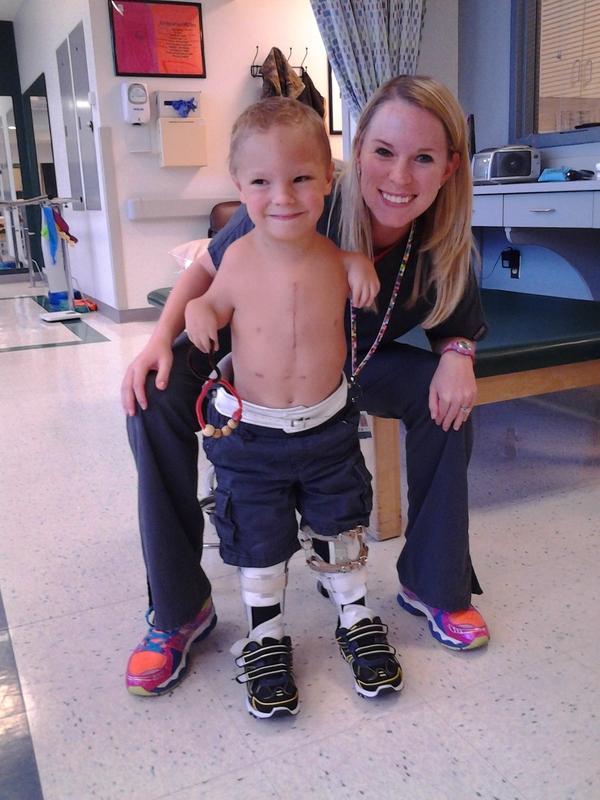 Drew has had a brace on his right leg since October 2012 and has had his left one since this July. At first, they were a blessing since there was no fixator to worry about any more, but they’re starting to really get on mine and Drew’s nerves. Mostly because mine and Daddy’s (and once his therapist’s) fingers have been victim to an agonizing pinch in the hinge at Drew’s hip. One rogue finger gets in the wrong place and it will ruin your entire day. Drew has actually pinched himself in the hinge as well while rolling and scooting around, actually leaving a mark on his hip. Just this morning, while cleaning the brace after it got soaked in urine from an overloaded diaper during the night, I saw that this hinge was covered in dried blood. My lower back has begun to protest from the non-ergonomic lifting and hunching over to remove and replace his braces, which with the multiple straps and adjustments to get his leg situated correctly inside takes several minutes. It comes off at least twice a day, one for therapy and once for bath as Drew is under strict orders to wear the brace 23.5 hours a day (which we currently exceed since therapy is one hour and then the 30-minute or so bath). And, because his brace is on for so long, his growing toe nails go unnoticed until one day, his talons have evolved into dangerous weapons. Even though he’s lighter to carry than when he had his fixators, the braces still add significant weight to him and since he can’t bend his legs (both because he has achieved the full range of motion in either leg yet and his knees must remain locked at all times), carrying him is uncomfortable with two legs stuck rigidly straight out all the while I’m fumbling with my fingers in hopes to avoid the aforementioned pinch. And, I have slight guilt over the stocking choice we made to wear underneath the braces. He used to wear thick white socks given to us by the orthotist, but we feared they were too hot during this humid summer and were tired of gagging when removing them after a long day’s sweating in the sun. So, searching for a lighter and breezier solution, I settled on women’s pantyhose knee-high stockings. I couldn’t find any plain white stockings so I had no choice to buy black stockings complete with frilly embellishments. 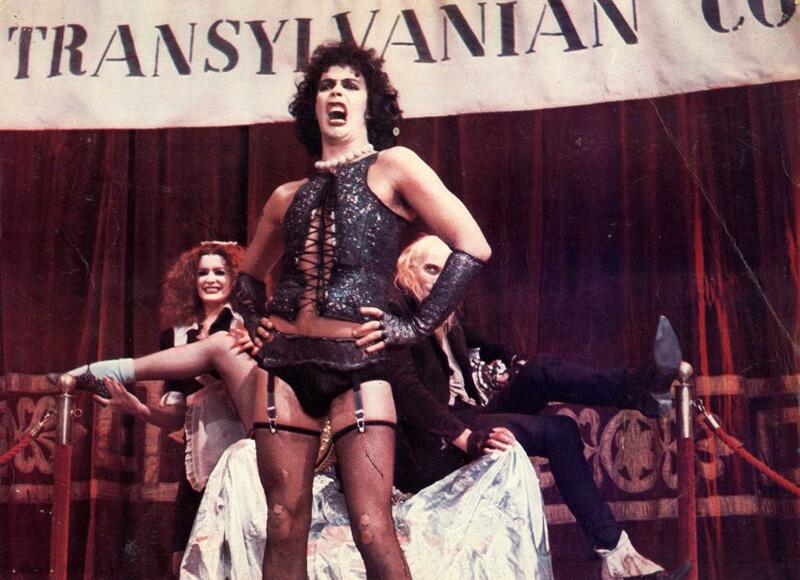 So, now every time I remove Drew’s braces and see the sleek lines, rosy patterns and decorative dots I can’t help but imagine Dr. Frank N. Furter in the Rocky Horror Picture Show. I’m sure this will be ample material for Drew to review with his future therapist. All in all, I’m over them. Drew is over them and has expressed his disappointment in having to wear braces a several occasions. I feel so bad for him as I watch him try to move around with these restrictive braces. He’s unable to bend his legs to aid himself in raising up from a laying down position to sitting so he must instead rock back and forth like a seesaw until he gets enough momentum to sit up once again. Instead of just turning around as you and I would, he must inch each leg to the side (his brace includes a belt at the hip in which each brace is hinged to, thus preventing him from spreading his legs much), inch by inch, until he’s achieved his 180-degree spin. And, God forbid he’s out of his brace for a minute too long as his left leg causes a lot of pain to straighten out once he’s been without for too long. I’m just done with it! I can’t wait until October for our follow-up appointment with Dr. Paley again. Maybe there will be a change with his brace. But, then again, maybe there won’t be. I’d sure like to know more about his braces such as will he always wear this same style brace or will he eventually get a more compact set? After all, I was told his braces “weren’t going to be restrictive” and as I’ve described, I’m sure everybody would agree that the current braces are exactly that. Will Drew always wear his braces for the entire day? Isn’t there possibly ANYTHING that we can do so he doesn’t have to wear braces until “growth stops”? I may have all of these questions about Drew’s future, but while Dr. Paley is an excellent…brilliant surgeon, I know that I likely won’t get any reassurance or real answers about Drew’s braces. I’ve learned I have to go with the flow and not ask questions which is difficult to do when things are so hard. I just want to know are things going to get easier? It’s not that I don’t recognize that things haven’t gotten easier than his fixator days, because they certainly have, but we’ve gone from one set of problems to another. Granted, at least our new set of problems doesn’t involve as much pain but the braces have turned out not to be such a relief otherwise. I just want reassurance that this phase of inability to use his legs will one day be over. 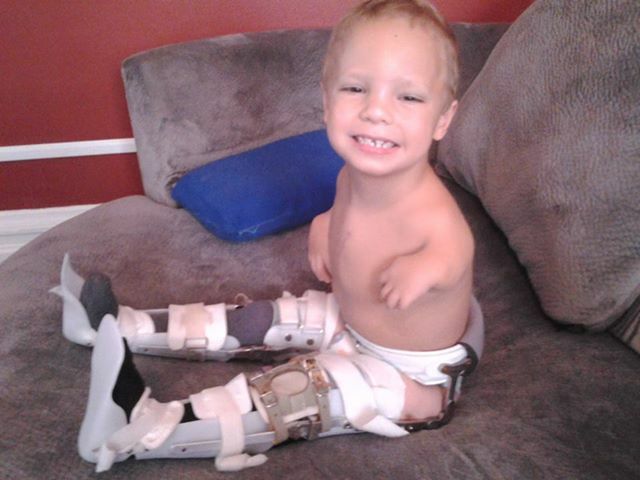 His legs are corrected now, but his progress has been slow and I now wonder how much Drew will really be able to do. Will Drew ever be functioning at 100%? My scariest thought, one that I can’t even spend more than a few seconds considering without feelings of panic and depression creeping up on me, is that he won’t ever achieve our end goal. I fear that my expectations were too high all along. I fear that we’ve corrected his legs and that’s about as much as we’ll have gained from this year and a half. I fear that this is as good as it will ever get. Drew stands! (all by himself) I think Drew has a crush on Ms. Sara, his therapist! Drew is standing for short periods of time though so I have to brag and praise him for that. Even with all of the set backs that he’s had: a broken leg, surgeries and a heart surgery, Drew hasn’t regressed too much. I was afraid with the 4-6 week restriction in place post open-heart surgery would have stolen his newly acquired ability to maintain balance, but almost the minute the restrictions were lifted, Drew was actually able to stand up with little effort. It’s not that he’s not making progress at all, it’s just that I fear that this is the peak. Patience is a virtue that I’ve never enjoyed. 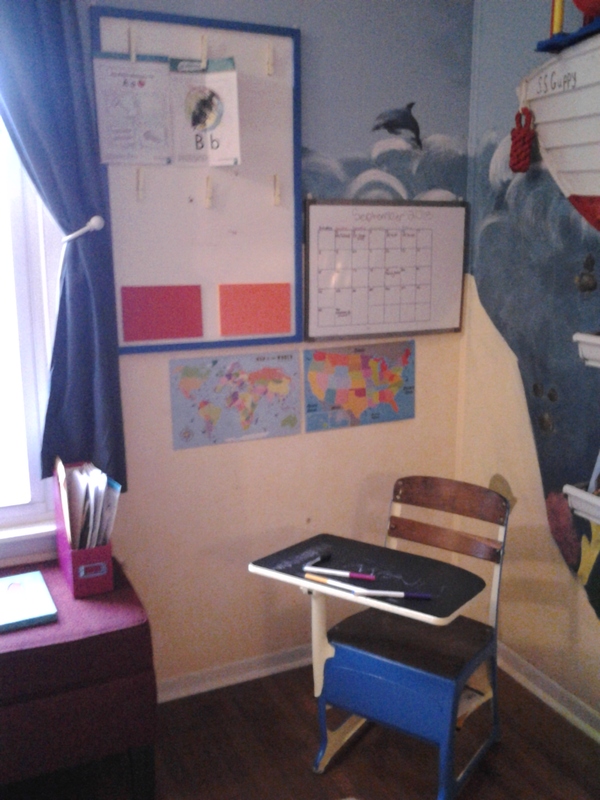 Drew’s DIY school corner where he does his homework. to our surprise and delight. Prior to the first day of school, Nathan spent about an hour a day struggling at most times to get Drew to cooperate during his improvised “school lessons” he created in order to do what he could to enhance Drew’s mind and prepare him for the school year. And, while Drew would do well once he decided to cooperate, it was getting him to cooperate that was the challenge. I was truly worried about how Drew would behave in school since he proved to be so difficult and defiant about learning at home. And, I have to give props to Nathan for putting up with it because there were days that I wanted to my fist through a wall and I wasn’t even the one wrestling him into cooperation. So, when Drew came home from school each day and declared how much he liked doing homework, it was shocking. I worried that Nathan wouldn’t even believe my stories of Drew sitting happily doing his homework, excitedly telling me how fun it was. I almost felt bad for Nathan having to go through the emotional torment of being so frustrated over our own “school hour” only for it to be so easy now. I guess his fixators really affected him more emotionally that we initially thought. But, what a relief it is. At least we don’t have to worry about that aspect of school. However, I’m still worried about the time, whenever it happens, when the bullying starts. It’s been three months and Drew has still not accepted Holden as his brother. I’ve caught him sneaking a glance or Drew’s curious feel of Holden’s foot or hand, but generally, Drew will still have little to do with him. He tells me he doesn’t like him and God forbid someone asks Drew about Holden. Drew will immediately shut down and almost refuse to continue to speak with the person, even after changing the subject. Asking Drew about Holden is a mortal mistake! Just don’t do it! It’s not that I think that Drew would have much to contribute to a newborn baby, but I’d like to be able to at least sit next to Drew while holding Holden or even take a picture of them two together without a hateful frown on Drew’s face. I feel like I am managing two different lives, never getting the chance to merge them into one. *Sigh*….hopefully things will change eventually. However, I’m sure the amount of time that Drew has to wait on his needs due to the fact that I’m confined to the couch breast-feeding Holden or having to shift my attention from Drew to tend to Holden’s needs, isn’t doing a lot to win Drew over. And, as glad as I am about Drew being able to wear underwear during all waking hours, at times it’s a pain since Holden nurses so frequently and if any woman reading this breastfeeds, you know how annoying it is to have to interrupt a perfectly comfortable nursing session with a comfortable baby. And, one more complaint about Drew’s braces: the hard plastic and extruding metal is painful against my full and tender chest! Ugh! !